Parents prepare for the inevitable. Bumps, bruises, and aches definitely fall under that category. The Warmy by Magic Bag line provides parents with practical hot and cold packs that have friendly and functional designs that are fun for children. Each Warmy hot/cold pack is a knit animal friend to help children feel more comfortable using them. Currently available are the Blue Cat, Pink Cat, Bear, Rabbit, and the Warmy Mini for older children who have outgrown the plush toys stage. Each Warmy can conveniently be kept in the freezer to cool it, or be put in the microwave to be heated in just minutes. Wish they made them "in your size"? Not to worry---they do! The original Magic Bag line has a variety of hot/cold packs to suit your needs (but sorry, they're without the adorable presentation of the Warmy line!). From a pad to place on your back, a neck-to-back bag, and their heatable slippers, you can find all you need and more from their full line of products. From a long day at work, to a busy afternoon filled with recreational activities, there are plenty of reasons why keeping a Magic Bag on hand at home just makes sense. It's an essential---just like a first aid kit. Baby E has been using both the Blue Cat and Warmy Bear. I highly recommend having two Warmy products in your household at all times: one to keep in the freezer and one to have on hand and ready to go into the microwave. The Warmy products, having a natural rice filling, cannot be reheated too frequently or it will cause the rice to burn, and so in emergencies it has been useful to have the extra one in the freezer to bring out if necessary. Having one kept in the freezer prevents you from losing time cooling it down. This way, the Warmy is always ready just when you need it! 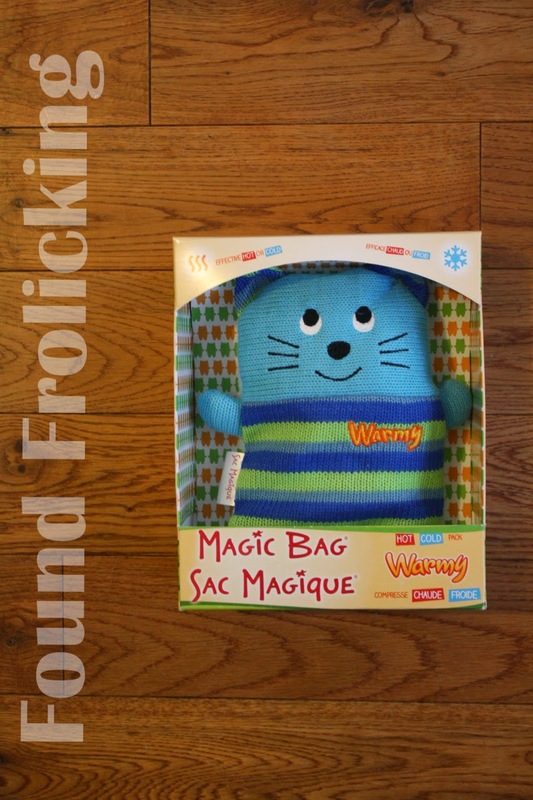 Before having the Warmy products in our home, I would go the traditional route and try to use a bag of peas or some ice cubes put into a Ziplock with a tea towel wrapped around it, but my son never wanted anything to do with them. He always looked at them suspiciously as if I were trying to do something funny. It has never helped that he couldn't understand the benefit of having something that's quite warm or cold against his skin, either. But he'll happily sit down with either of his Warmy buddies---he's even given them hugs on occasion! 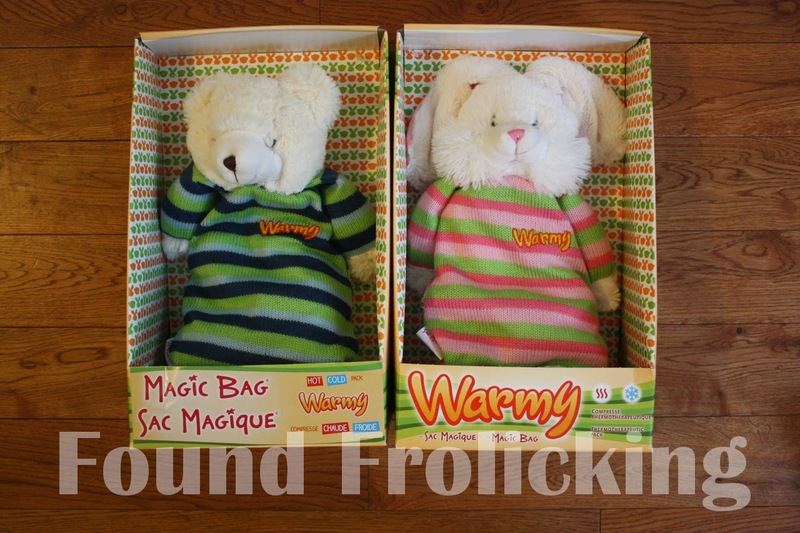 The large format of the Warmy Rabbit and Warmy Bear in particular make them the perfect size for being cuddled. Their cute design helps provide a great distraction when he's upset about a bump or bruise as well. Since he only sees them after a small accident, they always grab his attention. I would certainly recommend the Warmy products as a household essential for any parents. 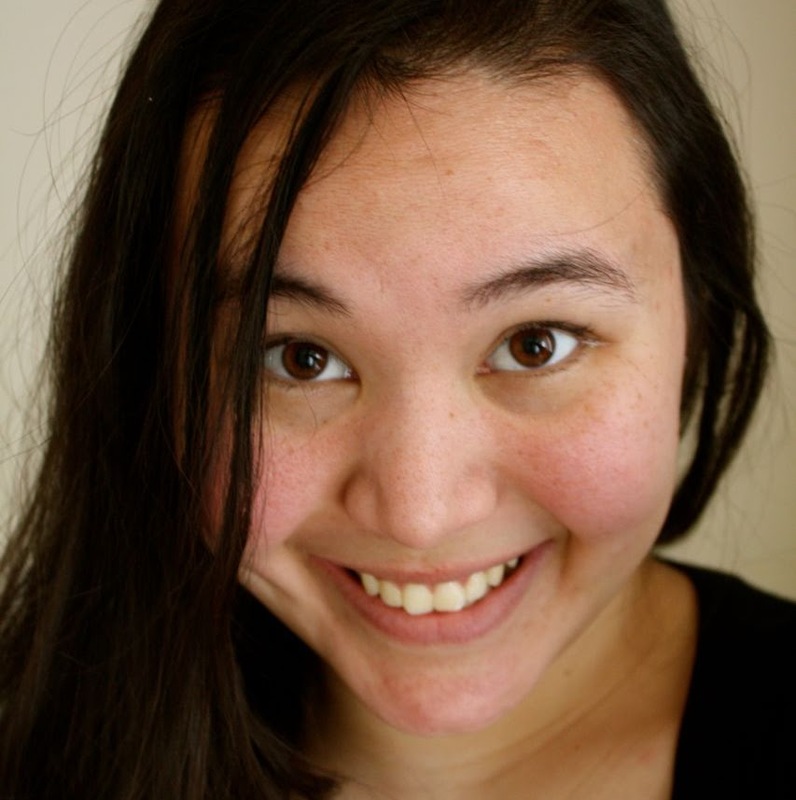 Being prepared for all of my toddler's mishaps and having a system that works saves me the time and stress of running around trying to find substitutes for the things I really need immediately in the moment. Thanks, Warmy! 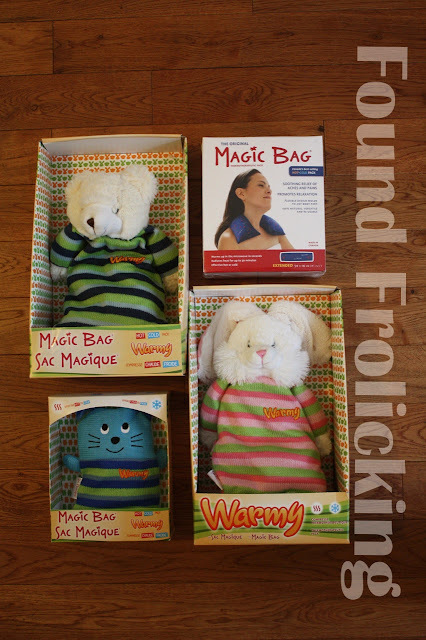 To purchase Magic Bag or Warmy by Magic Bag products, please visit their website. 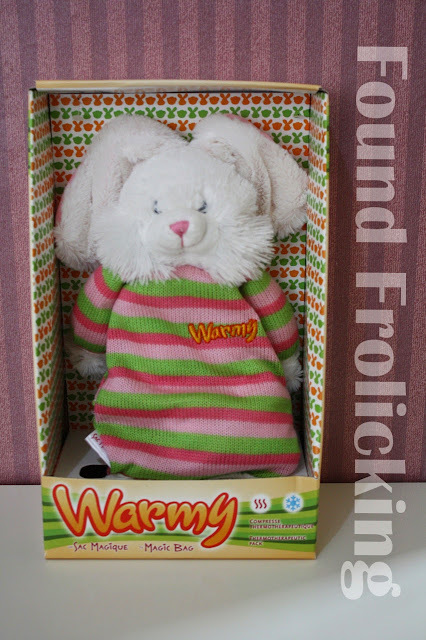 You can learn more about the Warmy line by clicking here. A look at just a few of the great products Magic Bag has to offer. Meet the Warmy Bear and Warmy Rabbit! The adorable Warmy Blue Cat is a nice, small size for the little accidents in life. 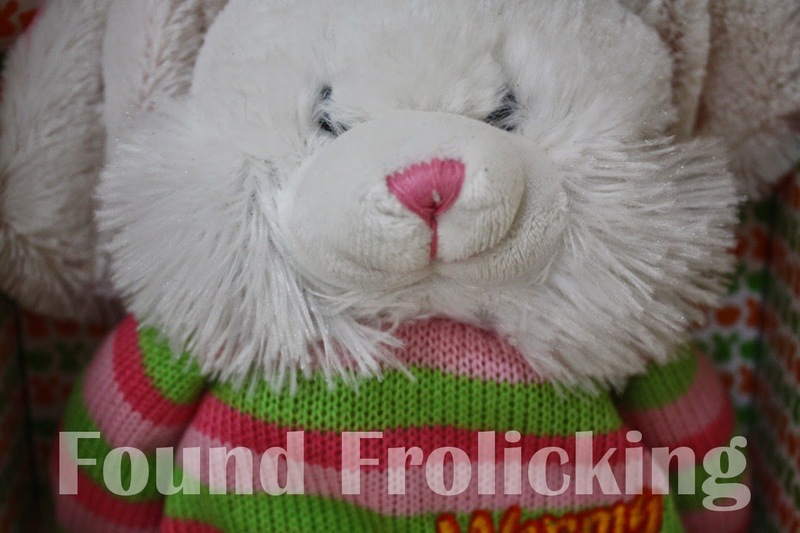 The sweet-looking Warmy Rabbit features adorable floppy ears and is perfect for cuddling! A close-up of the friendly face of the Warmy Rabbit. 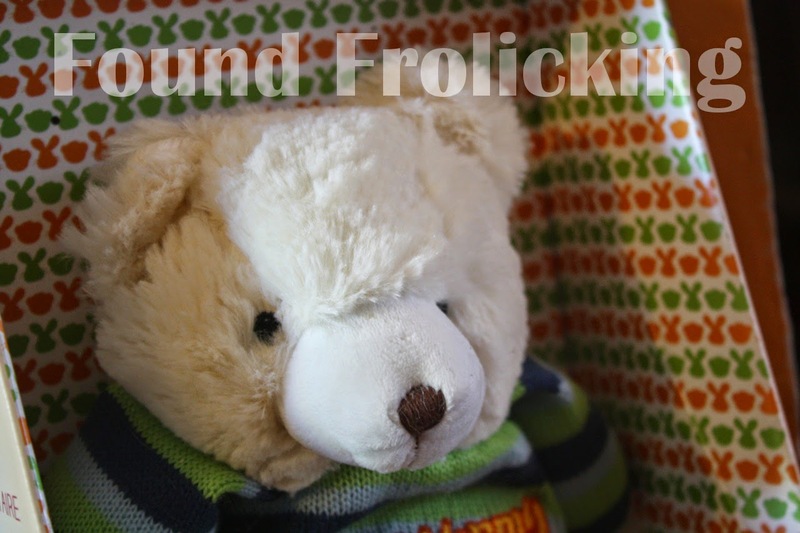 Closer look at the lovely Warmy Bear, just waiting to jump into action. 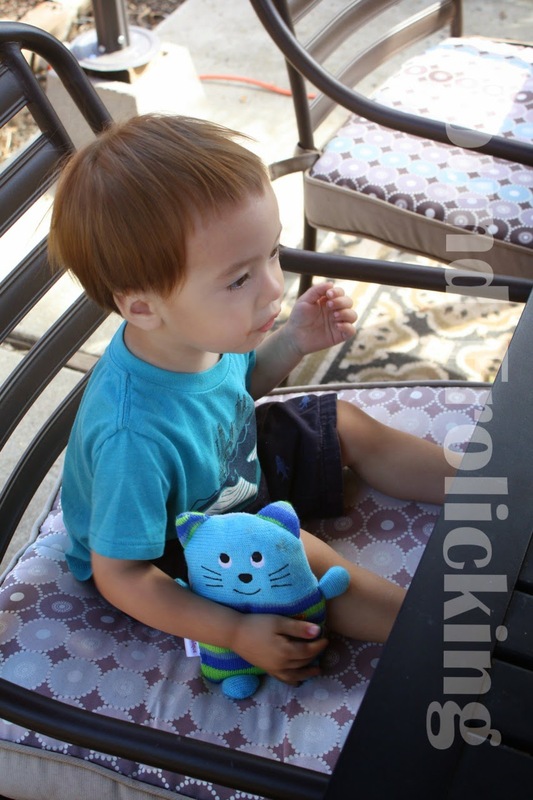 Sitting down with his Warmy Blue Cat and a snack are the perfect remedy to a little bruise. 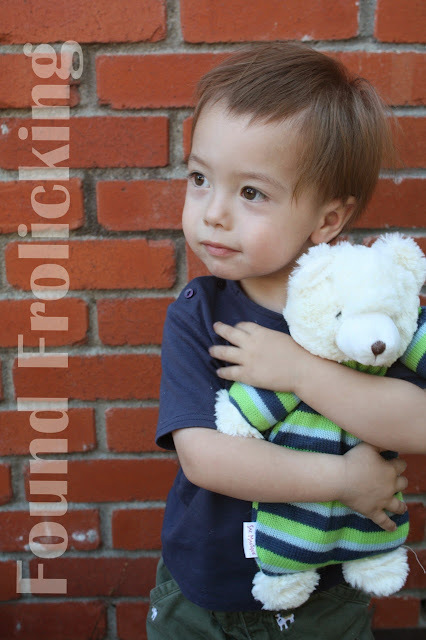 Little E hugging his Warmy Bear! This are super cute. I have something very similar and use it all the time. I just recently tried it in the freezer. I need to make some homemade packs using old socKS and rice. That is such a great idea.. I had to take my dog to the vet yesterday and she needed shots ( i know we are talking about kids) and the vet said to us, does she like shots.. i said to her (about my kids) does anyone like shots.. i think this definitely would make a child feel much more comfortable when they get hurt or have to goto the Dr. These are adorable! My niece would love these! He is so adorable and so are the Magic bags. I will have to share this with my sister and my niece because they both have lil ones., Thanks for sharing. I like that it's a rice filling. 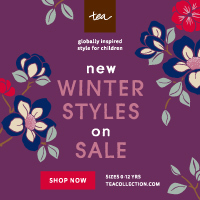 They're cute as can be too, making them even more appealing to purchase. those are so cute, i'll have to look into them a little more. Aww, these are so adorable! So much better than ice in a dish towel, which is what I had when I was growing up and automatically what I did for my stepdaughters when they got bumps and bruises while playing and horsing around. If they were still a little younger, these would be great to have around. So sweet---an extra pal when you've got a boo boo is a great idea---I love the bunny! !